Benjamin F. Gregory - Visionary or Nutjob? Benjamin F. Gregory, born in 1889, was a visionary, a pioneer, and maybe even a little bit of a nutjob. This may be a little indicator of what he was made of: He survived no less than seven plane crashes before dying of natural causes at the age of 84. Besides his interest in aeroplanes, he a also had a profound love for the equally new automobile. At the age of 18 he started racing, and four years later, in 1912, he drove his first front-wheel-drive race car. A car from Walter Christie from Hoboken, New Jersey, a FWD pioneer. 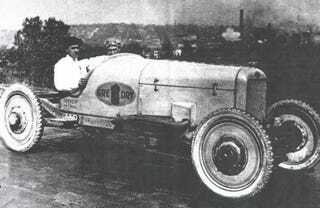 Having fallen in love with racing in general, and FWD in particular, he started the Front Wheel Drive Motor Company in Kansas City, and built his first race car with a 90 hp Curtiss plane engine in 1919. His next car with a Hispano-Suiza plane engine had twice the power, and got clocked at 230.1 kph, quite a feat at that time! He then moved on to “mass production” in 1921. About 30 Tourers, which he asked $ 1550 for, are said to having been built. This is either the first, or among the first FWD production cars in history! But, although being heavily funded for that time, he had to declare bankruptcy a year later. Frustrated about this development, he took a break from automobiles and turned to his other love the aeroplane. Having played around with light aircraft made from bamboo, he now started his own aviation business. By the early 1930's, he owned several Ford tri-motor planes (similar to the Ju 52) and ran a private airline. Being quite innovative, he even set up shop at country fairs, where he offered 7-minute rides for 50 cent per passenger. In Cedar Rapids, he once had almost 100 lift-offs with 1060 passengers. He's also claimed to be the inventor of the “wedding above the clouds”, complete with rent-a-minister. In 1942, he had his 7th (SEVENTH!!!) plane crash, and decided to keep his feet on terra firma from now on. I couldn't quite find out what he did during WWII, but in 1945 he started a company called Gregory Front-Drive Motor Cars, again in Kansas City. Their first product was The '47 Gregory Sedan prototype, a compact car with a 22hp 4-banger from a light aircraft and, yeah you guessed right, FWD. This shortly after the war, a gas-sipping compact might have been the way to go, FWD or not. It's reported to have a fit and finish that was worthy of a production car. The awkward part was the position of the engine though. It was rear engined! Yes, you heard that right. The prop-shaft transferred these massive amounts of power back-to-front. I honestly can't see how that didn't catch on. It's now at the Lane Motor Museum in Nashville, TN. Despite the car failing, he stuck to the front engine, FWD layout with his next project, the exclusive 1953 Gregory Roadster. For that, he basically reverse engineered a Porsche 356. No, not what the Chinese are doing these days. 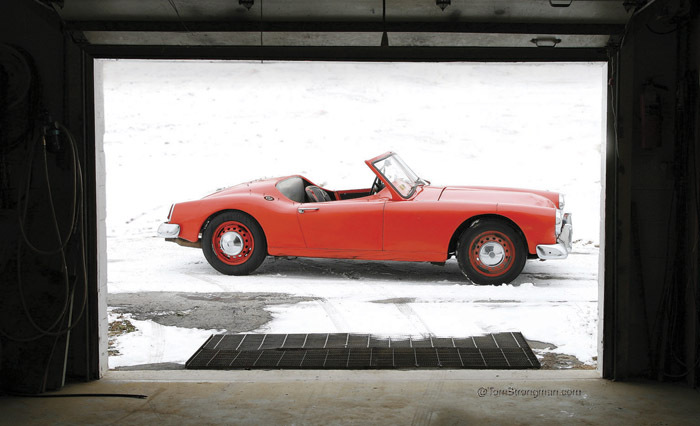 He took the basic layout from a Porsche 356 and reversed that! The 55 hp air-cooled Porsche boxer engine from a 1500 cc 356 now sits on the front, powering, you might have guessed that by now, the front wheels. When looking at it, one is surprised by the modern design. Keep in mind that it predates a lot of similar cars like the MG A! It's only let-down are the heavy bumpers from a Ford Sedan. Road & Track ran a lengthy article about it in 1956, saying this was only a prototype, and the finished product would have a more refined plastic body. Gregory was aiming at a price of around $5000. He might have thought that exclusivity is always a little bit more costly. But while this is true in general, you could get a Jaguar XK 140 for much less than that. So it stayed a one-off. At that time, Gregory was also working on a small military vehicle for the US government. The M422 Mighty Mite was also powered by a German sourced flat four. Probably a little too much German involvement to the government to be considered a reliable engine source. After all, they just had finished fighting them on the battlefield. Did, I mention that it was FWD already? They had a limited production run of almost 4000 cars with 4WD and a V4 engine made by AMC, but that was it.